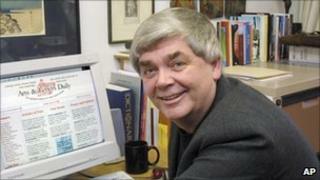 Author Denis Dutton, founder of the pioneering Arts & Letters Daily website, has died in New Zealand aged 66, his family have confirmed. Dutton had been suffering from prostate cancer, but had continued to work until his health deteriorated a week ago. "I think that he has been an incredibly passionate advocate for ideas and truth, and a wonderful father and husband," his son, Ben said. Dutton established the popular Arts & Letters site in 1998. The groundbreaking site was an early internet aggregator, which featured links to commentary on arts, literature and events. The site, which was designed to look like an 18th-century broadsheet, quickly gained a loyal following, with The Guardian newspaper dubbing it as the "the best website in the world" in 1999.